Must We Accept the Hatred That is Reigning? It is easy to succumb to the hatred that rages across the Earth today, especially in light of the political conventions held last week and this. No wonder—almost every day news reaches us of another shooting or terror attack. No country is immune to the terror. Whether internal or external, hatred brings violence and terror. 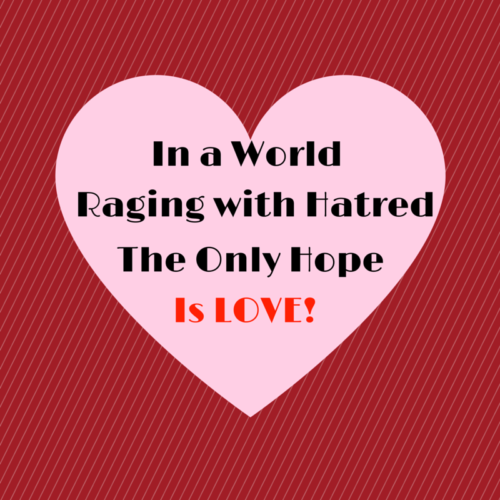 Some people feel compelled to express their hatred by shouting bad things about others. Others express their hatred in murdering members of an opposing culture, religion, or country. Often, the story of murdered Christians, or Muslims, or other religious sects in far away countries becomes lost in the arguments of politics or violence at home. Men, women, and children are at risk, for the hatred of others leads to violence, terror, and murder. What can be done? How can we, as individuals, combat this trend of raging hatred? One cannot battle the large numbers of haters. However, one can set examples to others, can have an effect on those in our smaller circle. What is the answer? Love, simple love. Love, as exemplified by the Savior of the world, accepts each person, regardless of that person’s political beliefs, their religious beliefs, their sexual activity, their gender, or their so-called race. All are sons and daughters of God. All have redeeming qualities. He cares about us and wants us to return to His presence. His love is unconditional. Can our love be like His? Can you love someone who is different from you? Someone who behaves in a way you do not like or believe in? Someone who has hurt you? I believe you can. Loving the person does not mean loving a behavior. I have friends who participate in behaviors I do not agree with. I have had my trust broken and been hurt by those close to me. I have learned that I can love these people as long as I remember who they are, children of God, not the behavior that I disagree with or that hurt me. I am working to be more charitable, to have love for others, regardless of their actions and beliefs. It is difficult, but as I think at them as Christ would, I can succeed. What has all this to do with Eve and the books I am writing? Much. For I believe the things she told me about their lives. She and Adam looked forward to the coming of Christ in the meridian of time. She knew Christ’s love, though she called Him Jehovah. She knew of His willingness to forgive. She, more than any, knew we are all His children, and all her children. Eve continues to weep for our actions and our hatred for others. Will you join me in my personal challenge to learn to love others for who they are, not what they do? We can change the world, one person at a time as we love those around us. I’d love to hear your stories of love for those you thought unlovable. Please share.